First blog post of the year! I still haven't quite figured out what I want to do with this site nor have I picked up the pen with respect to my creative writing, but I'll get there. 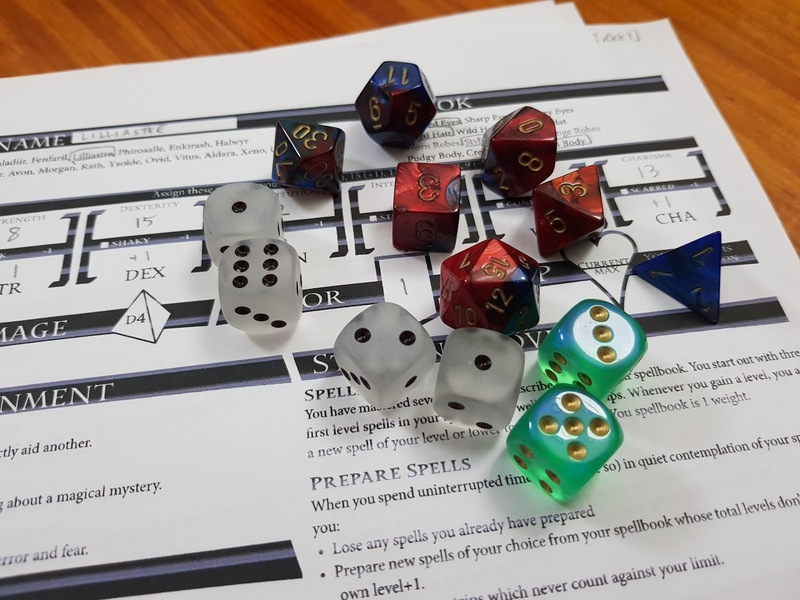 So in an effort to write something other than a review (you can go to my GoodReads for my book stuff), I thought I'd take some time to talk about a quirky aspect of the tabletop gaming hobby - how good it feels to roll dice. Whenever I find the need to explain our RPG hobby, my initial statements tend to involve explaining that I'm referring to pen and paper RPGs with dice and not computer-based RPGs and the like. And that's because it's a key aspect to the experience - how your actions boil down to the subtle manipulations of fate - and physical probability. My early exposure to White Wolf games, particularly Changeling: The Lost, really set up my expectations for how fun it can be to roll dice in a game. Sure, this is not a system known for totally crazy amounts of dice like some other systems (hello Exalted and Scion to name a few) but it really made it a lot of fun. The core system behind a lot of White Wolf games is pretty easy to wrap your head around. Typically you just need one success to get what you want. A success typically means rolling at least a 6 or a 7 with a D10 (that's a ten-sided die for you non-gamers) and on average you'll have at least three dice in hand to try to achieve that. So getting the basics of what you want is easy enough and that really encourages you to play your character to the hilt, embrace more risks and really work on crafting a good story with the rest of the people at the table. But there was more. Different power sets in the game allowed for rerolling rules like 9-again or 8-again that mean your successes explode into potentially more successes since you get to roll some more. Thus all the more you feel awesome as your character gets to do super amazing things since more successes allows for more fantastical results. And when you're a magical faerie creature, you really want to be able to do more epic things in order to face the even greater horrors within the Hedge. And so I came to love game systems that celebrate more and more dice added to the roll. And this is what I tend to call dice satisfaction - the feeling that you can twist probability in your favor by improving your stats, activating abilities and adding more dice to your roll. The power you feel when you cup more than a handful of dice before you roll is an odd geeky thrill in itself. Along the same lines it annoys me when systems limit your dice severely or adding dice doesn't help you. This applies to a lot of D20 games that boil down to rolling that one 20-sided die and seeing how things proceed from there. The worst "offender" in this book tend to be Fudge dice, which you could argue are just D3's disguised as D6's but the whole +/- element means that more dice can make things worse a lot quicker than they can make things better. I respect how they're supposed to work but in terms of rolling dice, they don't really make me feel great. There will always be exceptions of course. A good example is the DC Heroes system that actually only uses two D10's for all rolls, which doesn't sound like a lot of fun to roll. But the Hero Points system woven into the game that allows one to increase the potential effects of your roll by spending the same currency you use as "XP" still makes for a lot of fun and adds that element of playing with probability for your benefit. So yeah, I love games where rolling more dice means something. A bigger dice pool should mean more opportunities to be awesome and to allow your character to help grow the story and have awesome moments in the spotlight. Rolling more dice is meant to be full and should generate a bit of a thrill as you wait to see how they all tumble and learn whether or not you get to accomplish what you set out to do. And when they settle down and you look around the table and find out what happens next.